You are looking at an Antique Holy Bible - Parallel Edition - 1892 (undated). A beautifully illustrated Family Edition Holy Bible, including a number of full page Gustave Dore engravings from the 1890's. This Parallel Bible has gold-embedded and decorated covers (depicting scenes of the Bible) and spine, all with the text "Holy Bible" and gold gilt pages. 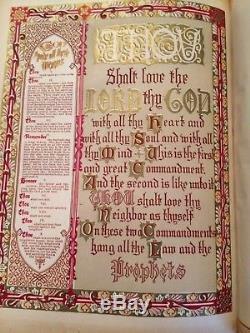 The text of this Bible the Authorized Version and the Revised Version presented in parallel columns. 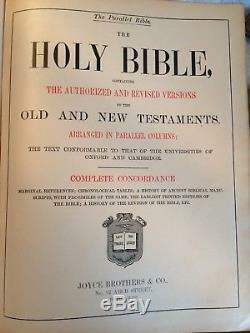 Additionally there are many additional study aids, like Various colored maps; Gallery of Scripture Illustrations; Views from Photographs of recent surveys of the Holy Lands; Self-Pronouncing Dictionary of the Bible; the Gallery of New Testament Illustrations; A New Practical Concordance; Parables of our Lord, and numerous other tables, overviews etc. Published by, Joyce Brothers & Co. This scarce bible is bound in leather and with black carved boards with gold gilt titling and illustrations on the covers and spine. 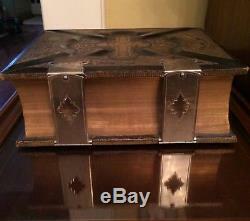 This massive bible measures approximately, 12.5" X 10.5" X 5.5. There is very light wear on the boards (rubbing) on the edges as you can see in the pictures. Two beautiful engraved metal clasps close the book firmly. Inside pages are tipped in gold gilt on outer three sides. All pages are extremely tight in a very tight binding. 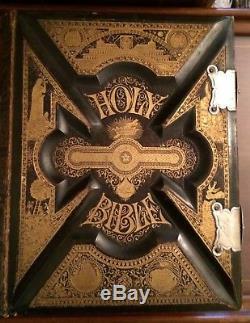 This Bible is in very fine condition for a 100+ yr old Bible of this size. 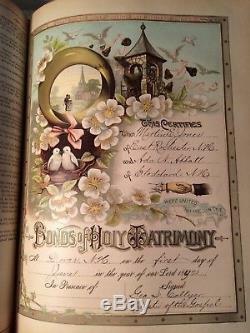 This bible contains numerous beautiful illustrations on steel, wood and in colors. Thank you for your interest. 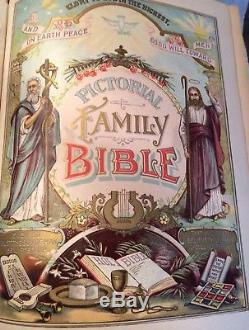 The item "Holy Bible Antique Parallel RARE Edition Pictorial Family Leather c1892" is in sale since Monday, December 18, 2017. This item is in the category "Books\Antiquarian & Collectible". The seller is "morganlady23" and is located in Madison, New Hampshire. Publisher: Joyce Brothers & Co.